Okay, maybe not love but pretty darn close. A rich chocolatey base with a soft and chewy chocolate chip cookie nestled on top, better know as a Brookie or Brookster. Originally named the formed by a bakery in Brooklyn, NY who initially concocted this creation. I must admit I had never even heard of them ( I know, I’m a little behind with the times) up until a few months ago as I walked around our neighborhood’s newly opened Williams-Sonoma and discovered a Brookster pan. I was immediately enthralled by the idea and new i just had to make these. For those who don’t have one of these marvelous pans ( a crime, I know), these bake up equally well in jumbo muffin pans. 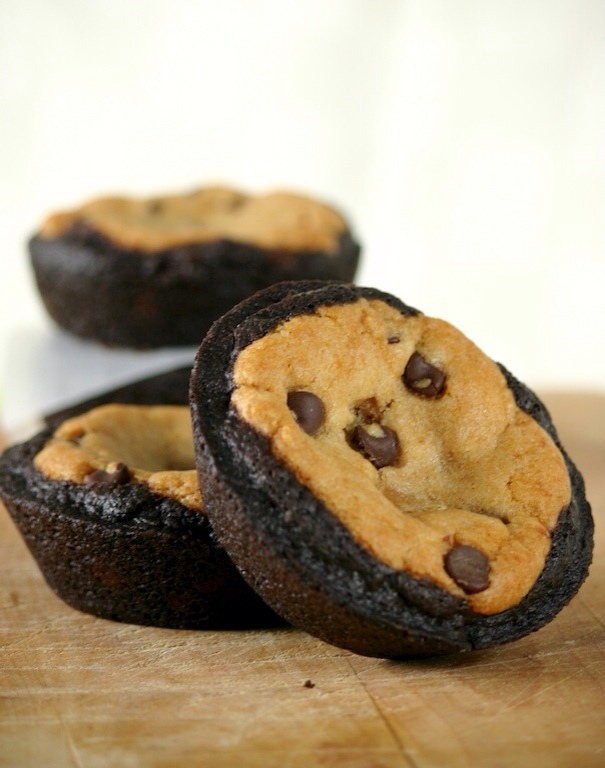 Just be sure to properly grease your muffin pan as it’s straight edges make these slightly more challenging to un-mold, but definitely not impossible. A small offset spatula or pairing knife and a gentle twist and these pop out pretty easily. A quick chill in the refrigerator makes it that much easier. The batch sent to my hubby’s work for taste testing yielded great results. The general opinion were that these were “SICK!” which was followed by several mobile uploads to instagram. So bake up a batch and serve them on their own or topped off with a scoop of your favorite ice cream and a generous drizzle of caramel sauce for a great aprés BBQ summer desert. Begin my greasing 2 six cavity non-stick brookster pans or jumbo non-stick muffin pans and set aside. To make the cookie dough, in a large bowl stir together coconut oil, sugar, molasses, agave, vanilla and applesauce. Sit to combine. In a separate bowl whisk together flour, baking soda, salt, and add to wet mixture. Mix with a silicone spatula until only a few trace of the flour mixture are visible. Add in the chocolate chip and stir to combine, being careful not to over mix. Shape the dough into a log and wrap in plastic wrap. Refrigerate for approximately 1 hour. To make the brownie base, in a large bowl whisk together the flour, sugar, cocoa powder, baking powder, and salt until uniform. In a measuring cup sit together the water, espresso, coconut oil, and vanilla. Make a well in the center of the dry mixture and add the oil mixture. Whisk until mostly smooth, a few lumps are ok. With a spatula fold in the chocolate chips. Divide the batter equally among the two pans placing about a 1/4 cup of batter into each cavity. Refrigerate for 1 hour. To assemble to brooksters, preheat the oven to 325°F. Remove the chilled cookie dough from the refrigerator and divide into 12 portions each approximately 2 tablespoons in volume. Roll each mound of dough into a ball and flatten into a disk between your palms. Each disk should be slightly smaller than diameter of each cavity. Press one disk of cookie dough into the top of each brownie base and bake for 18-20 minutes until cookies are lightly golden brown, rotating the sheets half way through the baking cycle. Place the pans on a cookie rack and allow to cool for at least 2 hours before un-molding. 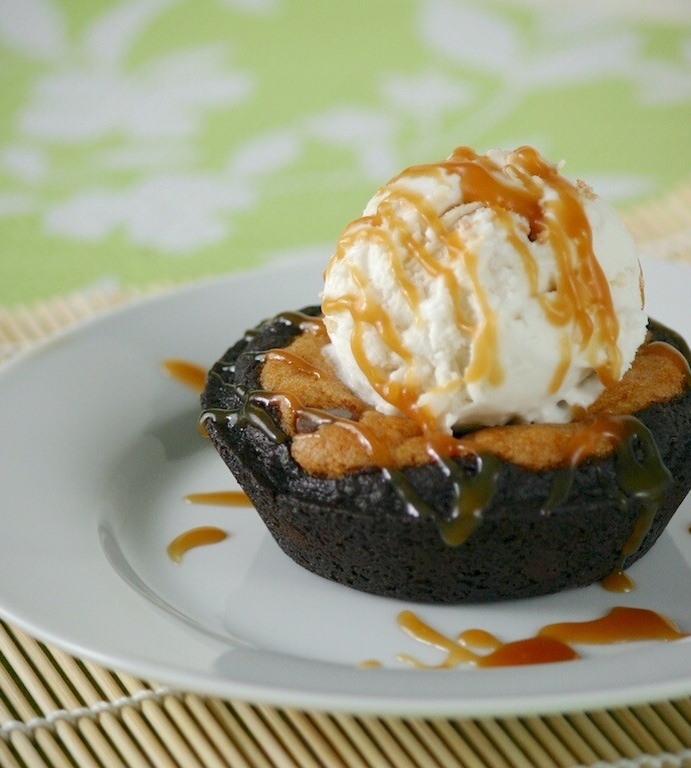 Serve as is or with a scoop of your favorite ice cream and caramel sauce. Brooksters will keep in an air tight container in the refrigerator for 4-5 days or can be frozen for up to 3 weeks. Mmm, sounds like a pretty accurate description of how love would taste if it were made edible, if you ask me! Those look so scrummy! I have a daughter named Brooklyn so I ‘need’ to make these now. Can the pan be ordered online? Yay! Checking Amazon now. I’m going to have to try making a gluten free version for me as well. Gluten free is my next challenge! This will be my first holiday season gluten and dairy free and I’m a little worried about caving. I’m hoping to have a decent arsenal at the ready. I’ve perfected a few gf recipes and I’m plowing through all my favorites to transform them all. tres cool et une tres belle photo.